The Grateful Hearts Introduces Hands on Workshops in a charming home style environment! The Grateful Hearts Workshops feature instructional learning of unique techniques and skills to create charming home décor pieces and more! Each project is customize by you. With options available from plank wood projects, framed wood projects, round wood projects, youth wood, canvas projects and canvas pillows and the list is unstoppable. We encourage laughter, dancing, singing, and believe doing the work yourself helps create the FUN! Come be inspired and let’s create together! Visit our boutique to finish off your look or to find that perfect gift! The Grateful Hearts Do It Yourself Art Studio & Boutique offers mixed media art to complete any project from journaling, scrapbooking to painting your masterpieces. Karen Lanier and Krystal Lanier-Turner are the owners of the Grateful Hearts. 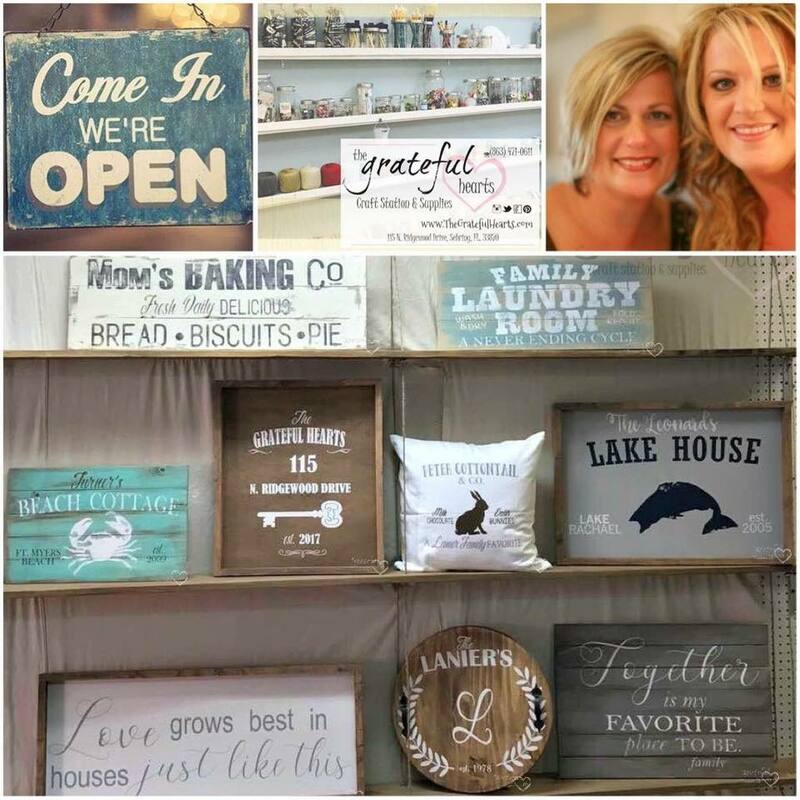 Their passion for home decor, design and of course socializing led them to open The Grateful Hearts® Do It Yourself Art Studio & Boutique in downtown Sebring, Florida. With the ever changing world of décor trends and DIY projects they are excited to offer the newest with stylish graphics and techniques. Make sure you visit the store 1989 Lakeview Drive, Sebring FL 33870 and attend a workshop soon! HOW The Grateful Hearts® Do It Yourself Art Studio & Boutique BEGAN ... Meet Karen (Lanier) and Krystal (Lanier-Turner). These two are the designers behind the founded company The Grateful Hearts®. Experts at designing creative projects, party planning, promoters of awesome girls night outs helping to join woman together for fun times creating lasting memories. This mom and daughter team has incredible talent featuring their creativity that has been inspiring to many for years, they have numerous creative pieces and ideas completed with more to be featured on a regular basis. The dream of having a workshop & craft station so they could teach their skills to others while offering a place for creating home decor, fun parties, creative workshops and simply joining others together has come true! Their vision is to create an inspiring and charming home style feel workshop & art studio so you can sit for minutes or relax while creating for hours. Karen and Krystal not only offer classes but also offer boutique items that they find would be inspiring to others and enjoyable to create together!